My name is Sylvie Michaud, born in Quebec, Canada, I now reside in Clarksfield, Ohio. 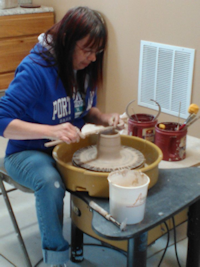 I am the owner and artist of Mich'Art Pottery Studio and Gallery. One morning in 1994, I woke up and while having my morning coffee, I decided I wanted to try something new, and that something was painting. I went to the art store and got everything I thought I needed to begin painting. My very first oil painting was "Canadian Winter House." In 2002 I started to combine my love of bird watching and nature with my paintings. My first bird was painted in 2002. (Premier Envol). I've always loved drawing, printing, and painting, anything that puts me in front of a white surface with a pencil, pen or brush. I've studied advertising, marketing and printing in school and worked for a printing firm for a few years. Now I paint and create pottery in my studio.